Our Prayer Network is composed of dedicated ladies and Deacon Jim Brown. 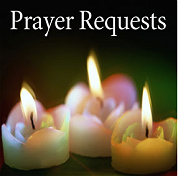 Our ministry receives prayer requests from parishioners and informs our network to pray for their special needs. All requests are kept confidential. Anyone may call with a name or names of individuals they would like to be lifted up in prayer. We pray for health concerns for one month and special intentions for two weeks. If prayers are need for a longer period of time, you may call again. We welcome calls for prayer. Also, we welcome any new members willing to pray and make some telephone calls. There is power in united prayer!